Even in the arid regions around the Mediterranean, an efficient irrigation system means good savings. System Build-up "Irrigated Extensive Green Roof"
“An extensive green roof only needs to be irrigated during the growing-in phase.” This statement doesn’t apply to all areas, of course. It’s plausible, that in dry climates around the Mediterranean an extensive green roof also requires additional irrigation. Even in Germany there are certain areas that suffer long, dry periods. There is an increasing number of such regions due to climate change. For areas that have a dry climate, the new “Irrigated Extensive Green Roof” system offers a very efficient and inexpensive solution. In contrast to a conventional, additional irrigation system, e.g. a lawn sprinkler, ZinCo has developed another system for capillary irrigation which has considerably reduced water consumption as the water is available directly in the root area and does not partly evaporate on the surface. Also, in comparison to the conventional dripline irrigation system, the new “Irrigated Extensive Green Roof” with its intelligent water distribution system has a clear advantage given that considerably fewer driplines are required. This means a lot of money is saved with regard to installation and water consumption. The lower part of the System Build-up consists of the Protection Mat TSM 32 and the drainage and water storage element Floraset® FS 50. 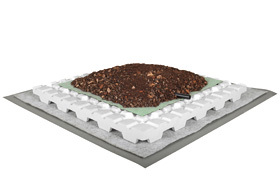 This 50 mm high element is made of expanded polystyrene rigid foam (EPS) and has water storage cells, openings for ventilation and diffusion and an underlying continuous channel system. This is followed by the newly developed Aquafleece AF 300 system as a significant and integral part of the new “Irrigated Extensive Green Roof” system. Due to its double-layer design, the Aquafleece AF 300 is capable of distributing the water coming from above across the entire area. The underside of the thick fabric of the Aquafleece only lets the water drip through if the upper side of the fleece is totally saturated. Driplines are attached to this Aquafleece using Velcro strips at intervals of about 50 cm. Therefore, if there is no rainfall, additional irrigation will take place using an automated system. The pulsating irrigation, that is to say, the brief irrigation at short intervals, means that water is available continuously. It reaches the overlying substrate through the capillaries and is available to the plants directly in the root area. A depth of about 8 cm of the System Substrate “Rockery Type Plants” is perfect for the appropriate plant community “Rockery Type Plants”. The fact that the drainage element beneath the Aquafleece can be chosen to match the roof pitch means that the system is very flexible and is suitable for roofs with a pitch from 0° to over 5°. Smaller roof irregularities with ponding can be easily dealt with. The “Irrigated Extensive Green Roof” will be widely used as an efficient, inexpensive irrigation option in the Mediterranean region. As mentioned above, regions with a temperate climate are faced increasingly with dry periods. In Germany, for example, this is the Mainz Basin and the entire North-eastern area of Erfurt, through Magdeburg and Berlin, up as far as Usedom. The annual average precipitation in the region is at times considerably below 500 mm. If you choose an “Irrigated Extensive Green Roof” you will have the advantage of it already being available in the sensitive growing-in phase for the plants, therefore, enabling a fully needs-based irrigation. 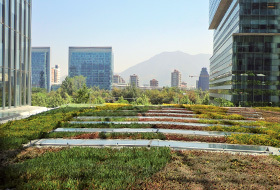 The new System Build-up “Irrigated Extensive Green Roof” with its highly efficient capillary irrigation system will manage to strike a balance between a cost-effective solution and the permanent proper functioning of a green roof in dry climates. 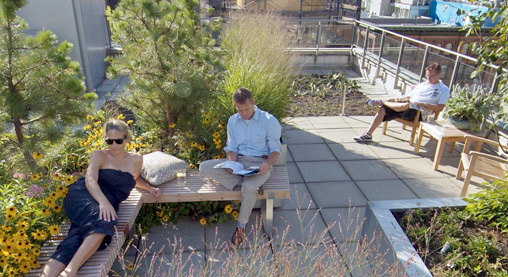 Only a healthy and lush plant growth will be capable of exploiting the ecological and economic advantages of a green roof for both humans and the environment. And, another thing – it also looks great!